It would be easier to explore the ocean if only we had electrical outlets and phone jacks on the seafloor. With 21st century technology, we are starting to install some. Cabled observatories use fiber-optic communications systems and electric power cables to establish grids for sensors on the seafloor and in the water column. Such infrastructure allows researchers to deploy, recover, and redeploy instruments for short-term campaigns or multi-year studies. 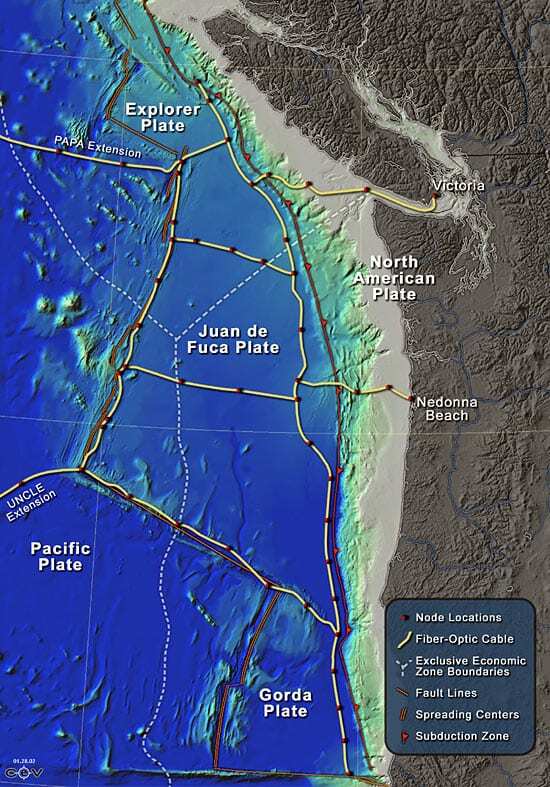 NEPTUNE would establish a 3,000-km network of seafloor nodes and fiber-optic and power cables that will encircle and cross the Juan de Fuca tectonic plate in the northeast Pacific Ocean. The area is a comprehensive natural laboratory for many Earth-shaping features and processes—seafloor volcanism, hydrothermal vent systems, earthquakes, seafloor spreading, and subduction zones. NEPTUNE is a joint U.S.-Canada venture led by the U.S. National Science Foundation (through the ORION Project office) and the University of Victoria. The effort has relied heavily on the efforts of the University of Washington, Woods Hole Oceanographic Institution, the Jet Propulsion Laboratory, and Monterey Bay Aquarium Research Institute. The University of Victoria leads a consortium of 12 Canadian research institutions that are participating in NEPTUNE, including Fisheries and Oceans Canada, the Geological Survey of Canada, the National Research Council of Canada, Environment Canada, the Vancouver Aquarium Marine Science Centre, the Department of National Defence, Parks Canada, and the Bamfield Marine Science Centre. Installation has begun on this advanced cabled observatory in Monterey Bay that will serve as the engineering test bed for a future regional, cabled ocean observatory such as NEPTUNE. 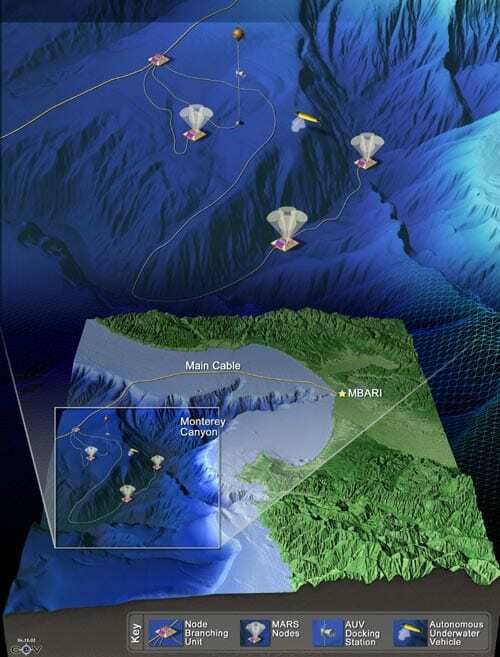 The MARS project--located in Monterey Bay and led by the Monterey Bay Aquarium Research Institute--will include one science node and 51 kilometers of submarine cable, with expansion capability for more nodes in the future. The science node will provide 8 science ports with 100-Mbit-per second, bi-directional telemetry, as well as 10 kilowatts of power. Organized by the Woods Hole Oceanographic Institution, this group is working to design and implement the undersea data communications network that will meet the communications requirements for the NEPTUNE observatory. Scientists and engineers from Woods Hole Oceanographic Institution and the University of Hawaii used an abandoned submarine telephone cable to create the first long-term, deep-ocean observatory called H2O (Hawaii-2 Observatory). The observatory operated from 1998 to 2003. ESONET is the proposed undersea component of the Global Monitoring for Environment and Security (GMES) program. The goal is to provide long-term monitoring capability in geophysics, geotechnics, chemistry, biochemistry, oceanography, biology and fisheries in 10 regional networks in contrasting oceanographic regions around Europe. Like the NEPTUNE system, ESONET will deploy roughly 5000 kilometers of fiber-optic cables linking ocean observatories to the land via junction box terminations on the sea floor.